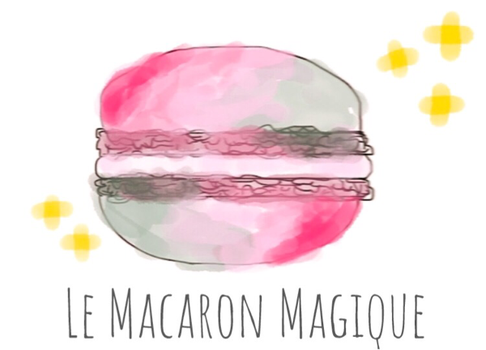 sakura anpan - 桜あんパン - lemacaronmagiques Webseite! When I visited a japanese bakery for the first time, I fell in love with this tender and sweet yeast dough bun filled with azuki bean paste (あんこ - anko in japanese). 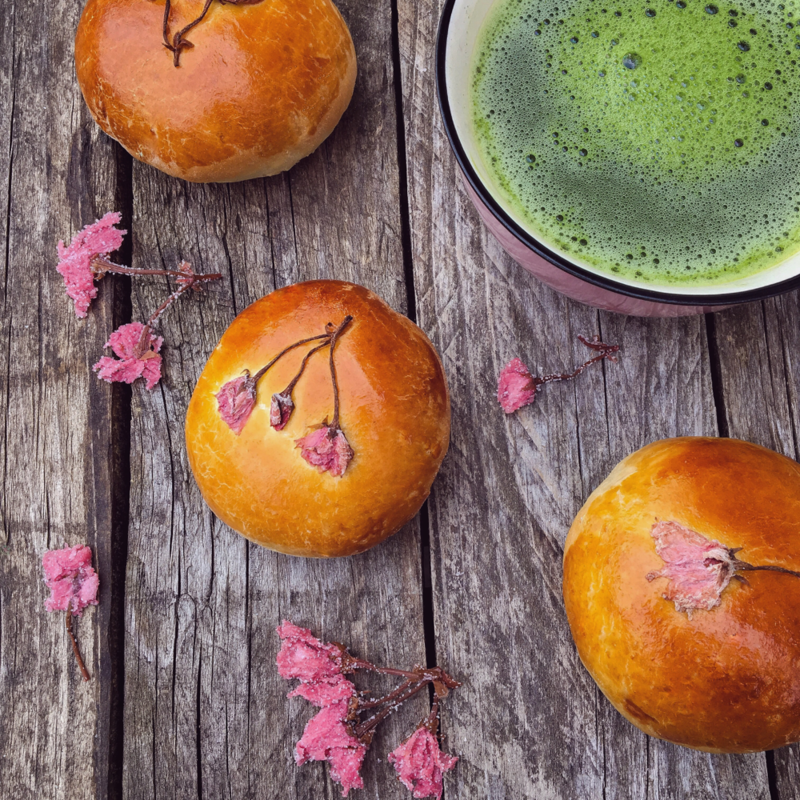 As the whole country ofJapan celebrates the lovely cherry blossoms (桜 - sakura) during spring I wanted to combine these two to create sakura anpan. They are literally one of the best things I've ever baked - I love the contrast of the rich dough, the sweet and flowery sakura anko and the slighltly salty sakura blossoms! 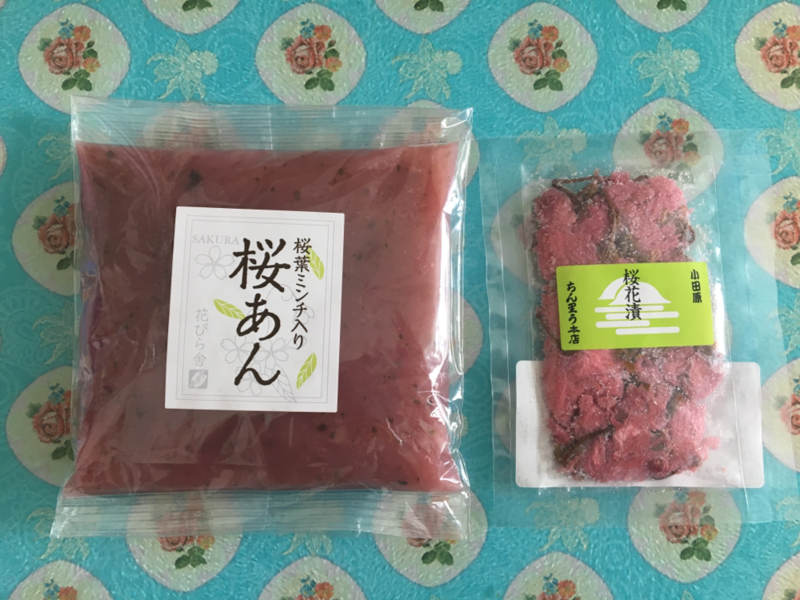 You can find the high quality sakura products I used online at Nihon Ichiban! Dissolve the yeast in the lukewarm water. Now fill flour, sugar, butter, salt and the egg white into a large bowl. Carefully add the dissolved yeast. Knead thoroughly until you have a smooth ball of dough. Store in a warm place for 30 minutes until it has risen. Now cut the dough into 10 pieces and flatten each of them. Put a teaspoon of the sakura an paste in the middle of each piece and fold the edges of the dough over the paste. You should now have 10 balls of dough with an paste in the middle. Store them again in a warm spot for 20 minutes. Preheat the oven to 180*C (circulating air). Dunk the pickled sakura flowers carefully into some water to remove the salt. Brush your anpan with the egg yolk. Now place a sakura flower onto each dough ball. Zerbrösle die Hefe und löse sie im lauwarmen Wasser auf. Gib Mehl, Zucker, Butter, Salz und Eiweiß in eine große Schüssel und füge vorsichtig die aufgelöste Hefe hinzu. Knete den Teig sorgfältig, bis er geschmeidig ist. Lass den Teig für 30 Minuten an einem warmen Ort gehen. Schneide den Teig in 10 Stücke und forme jedes Stück, bis es flach und rund ist. Gib je einen Teelöffel der An-Paste in die Mitte jedes Teigstückes und falte die Seiten so darüber, dass du einen Teigball mit An-Paste in der Mitte hast. Lass die Teigbälle weitere 20 Minuten an einem warmen Ort gehen. Heize den Ofen auf 180*C (Umluft) vor. Tauche die eingelegten Kirschblüten in Wasser, um das Salz zu entfernen. 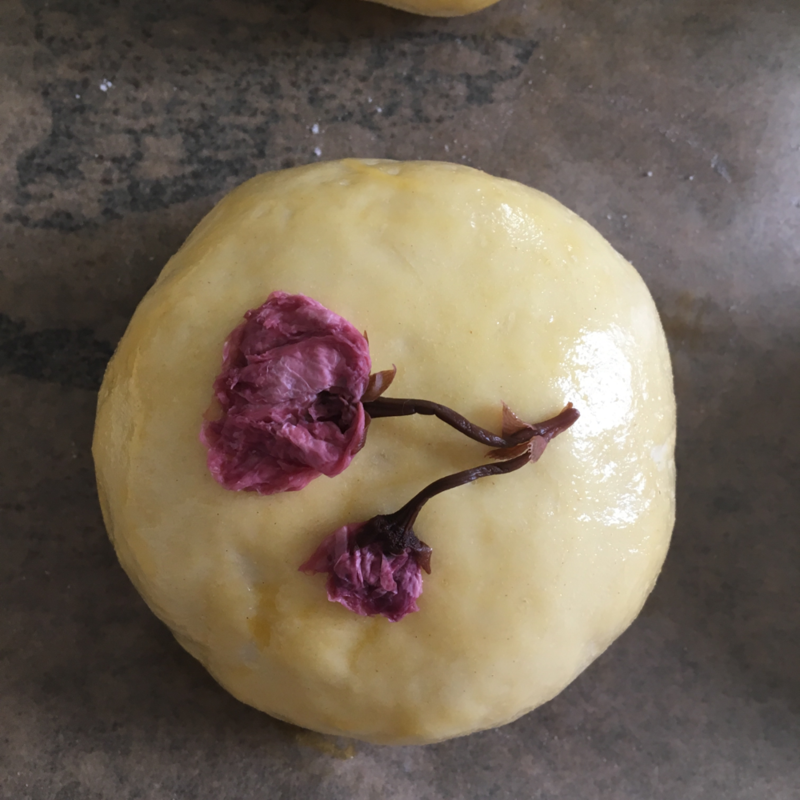 Bepinsle die Anpan nun mit dem Eigelb und lege je eine Kirschblüte darauf. 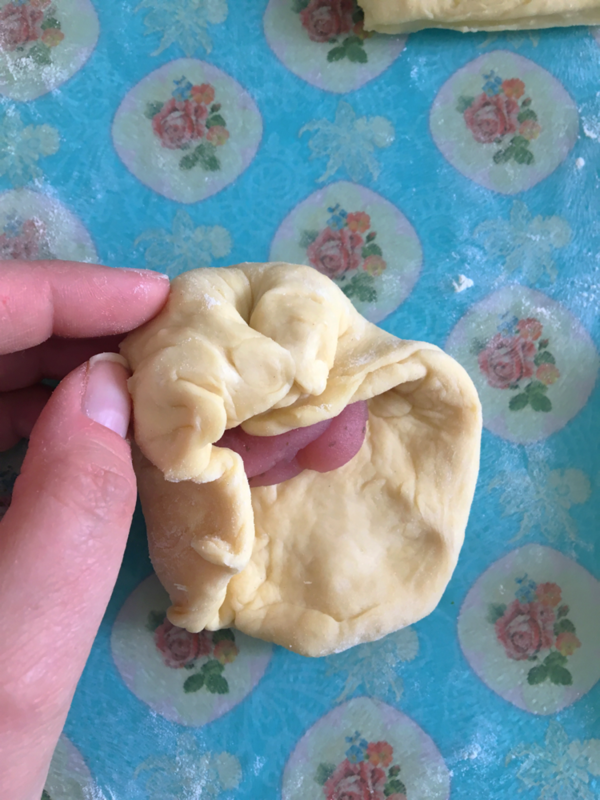 Backe die Anpan für 15 Minuten.